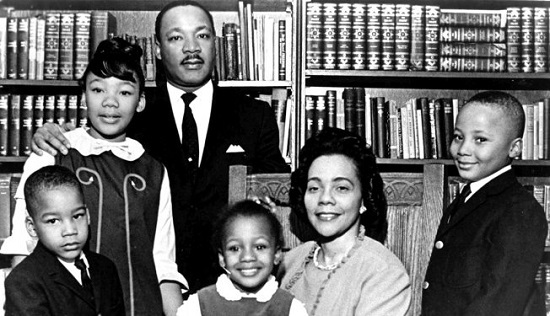 Martin Luther King Jr. with his wife and 4 children. Image source. Chapter 3 of James Cone's book The Cross and the Lynching Tree is about Martin Luther King Jr. bearing the cross, suffering in order to save others, and finding meaning from God in that. "It galvanized the country," recalled John Lewis, the Georgia congressman and veteran civil rights activist. "A lot of us young black students in the South... weren't sitting in just for ourselves- we were sitting in for Emmett Till. We went on Freedom Rides for Emmett Till." If anything was remarkable about the Till lynching, it was not so much the callousness of the deed as the militant response it evoked. If lynching was intended to instill silence and passivity, this event had the opposite effect, inspiring blacks to rise in defiance, to cast off centuries of paralyzing fear. The signal of this change was marked by the actions of Mamie Till Bradley, Emmett's mother, who refused to allow this heinous act, like so many similar cases, to remain in the shadows or to fade from public memory. When Emmett's body was brought back to Chicago, she insisted that the sealed casket be opened for a three-day viewing, exposing "his battered and bloated corpse" so that "everybody can see what they did to my boy." Cone talks about how he personally was affected by the news of Till's murder- Cone was 17 at the time and thought, "Emmett Till could have been me!" He says most young black men had similar thoughts. And I'm reminded of the articles I've read in recent years about the Black Lives Matter movement. Writers talk about a black man who was murdered, and say "it could have been me" or "it could have been my son" or "it could have been my husband." This isn't just an old thing from history class- this is still real now. Although blacks followed the trial closely, they knew that the two white men directly responsible for the shameful act, J. W. Milan and Roy Bryant, would never see a day in jail, even though they admitted in court to the federal crime of kidnapping. I remember when Trayvon Martin was killed, and we all followed George Zimmerman's trial, and when the news came out that he was acquitted... I remember reading tweets from black people like "this is heartbreaking... but it's not a surprise, we always knew he wasn't going to be convicted." Back in high school, when I learned about the civil rights movement and about Emmett Till, I didn't *get* how this must have such a huge effect on black people's lives, living under that fear and that knowledge that if you or your family members are murdered, the authorities might just do nothing about it. It must be completely terrible, from a mental health perspective, to know that "Emmett Till could have been me", or to know that a police officer can kill you and claim it's because you were "acting suspicious." I can only imagine the anxiety and stress of living with that every day. On the one hand, Mrs. Bradley's prayers reflected the obedient and patient spirit of the biblical Job: "Lord, take my soul, show me what you want me to do and make me able to do it" (Job 1-2). Yet, on the other hand, there was the rebellious spirit of the angry Job, who, feeling wronged by God, cried out "in the anguish of my spirit" and "the bitterness of my soul." "Why have you made me your target?" (Job 7:11, 20). Mrs. Bradley also railed at God: "Why did You do this[?] Why are You so cruel that You would let this happen? Why do You allow this kind of persecution?" Mrs. Bradley, however, was not left alone in her agony. She spoke about a strange experience, a voice that said to her: "Mamie, it was ordained from the beginning of time that Emmett Louis Till would die a violent death. You should be grateful to be the mother of a boy who died blameless like Christ. Bo Till will never be forgotten. There is a job for you to do now." Next, Cone turns to Dr. King, and first contrasts him with Reinhold Niebuhr, who we read about in the previous chapter. Niebuhr taught about justice and Christian ethics in a seminary, but King actually took action and risked his life to try to make that justice a reality. There's a lot of language in this section about taking up the cross, and a quote from Dietrich Bonhoeffer, "When Christ calls a man, he bids him come and die." This chapter was hard for me to read, because it shows what "taking up the cross" actually would look like- not the romanticized version we imagined in Sunday School. Back when I was a good evangelical, I "gave my life to God", but it wasn't like this. I wasn't in any actual danger- the worst thing that might happen as a result of my "taking up the cross" was someone deciding not to talk to me anymore because I had evangelized them too hard. But wow. King received death threats, and his house was bombed in 1956 (no one was hurt, fortunately). He had a wife and a baby, and he had to worry about their safety. And he knew it was very likely he would end up being murdered because of his activism. How can a person live like that? Seems like it would be so much anxiety. It would be unbearable. It would be impossible to have good mental health. He told his listeners that "I went to bed many nights scared to death." Yet King had no "martyr's complex." "I'm tired of the threat of death," he proclaimed in a stressful moment during the later protests in Chicago. "I want to live. I don't want to be a martyr. And there are moments when I doubt if I am going to make it through.... But the important thing is not how tired I am; the important thing is to get rid of [injustice]." King just wanted to follow Jesus, even if it led to his own death. He really believed what Jesus said to his disciples: "If any man would come after me, let him deny himself and take up his cross and follow me" (Mt 16:24). How did King live with the daily threat of death for more than twelve years? No one was more at risk than he. The cross of Jesus is the key to King's willingness to sacrifice his life, not only for the freedom of black people ("I will die standing up for the freedom of my people") but also for the souls of whites and the redemption of America. "If physical death is the price I must pay to free my white brothers and sisters from the permanent death of the spirit, then nothing could be more redemptive." Between the kitchen experience in Montgomery and his last sermon in Memphis, King was hounded by death. "He talked about death all the time," Andy Young recalled in later years. In fact, every time SCLC made preparations for a new engagement against segregation, King knew he could be killed. King developed a sense of humor to ease the tension and to enable himself and others to endure in the face of the violence that would engulf their lives. He preached mock funeral sermons for his friends. As Andy Young put it, Martin King "knew, more than anybody else, that every time he made a commitment to something like this [Birmingham] he was committing his life.... He thought in everything he did it meant his death. He would never say it that way. He would always say it in terms of us. He would say for instance, 'Now Andy, Bull Connor doesn't play.' He said, with a touch of hyperbole, 'They had fifty bombings in the last year, and you might not come back. You better let me know what kind of eulogy you want.' And even though he was talking about me, he knew he was talking about himself." He knew he was going to be killed, but this did not stop him from fighting for justice. His faith that God would be there for him cast out his fear of death, and thereby gave him the interior resources to cope with whatever came his way. He also knew that in the end there was no way to prevent someone from killing him. Every time someone was killed, he knew it could have been him. When John F. Kennedy was assassinated, he told his wife: "This is what is going to happen to me also. I keep telling you, this is such a sick society." Cone talks about how King found meaning in his suffering in Jesus' cross, and in his "kitchen experience" when "a voice" spoke to him in his kitchen in 1956, telling him to keep going. This is... this is heavy. As I read this, I'm struck by how, yes, this is what it would really look like for someone to "take up the cross." I heard so much talk in church about "taking up the cross" but nobody ever described anything like this- living for years under the threat of death- how do you even cope with that? In church they always talked about suffering as this big vague thing- like "yes if you are following Jesus, you will suffer, but it's SO WORTH IT." But now I don't believe that anymore. And as I read this, I'm thinking about the concept of counting the cost. King did count the cost, as we see from the quotes in this chapter. He believed what he was doing was important, it's what Jesus would want him to do, and it would be worth it even if it cost his life. But... what if someone else didn't believe that? What if there was someone else in King's position who didn't believe it would be worth it to sacrifice their life, so they chose not to be so involved in activism- would that be morally okay? I have to say yes, it would be okay. Because now, I believe in "counting the cost" in a way I never did before. And if we truly value "counting the cost", then that means it's also perfectly valid for someone to count it and decide it's not worth it for them, and choose not to follow that path. I'm not willing to give up my life. And I no longer believe that's a bad thing. Back when I was a good evangelical, I was willing to give my life for Jesus- but that was because I believed good Christians were required to feel that way. I never actually counted the cost. So now I believe it's perfectly okay to not be willing to give up one's life for a big grand cause- but remember that that's a privilege. The most vulnerable and marginalized people in society don't have the option of just "opting out" of life-threatening violence. At the same time, though, there's a line somewhere. I do NOT believe it's morally okay for me to decide, as a white person, that I just want to live my own safe life and not inconvenience myself with caring about injustice in the world. Depending on how much privilege, power, and money a person has, and what the "cost" is that we're talking about, sometimes it's NOT okay for them to decide "eh no I'm not willing to do that." "If physical death is the price I must pay to free my white brothers and sisters from the permanent death of the spirit, then nothing could be more redemptive." [In his eulogy for the four girls killed in the Sixteenth Street Baptist Church bombing] He contended that their "innocent blood" could "serve as a redemptive force" to transform "our whole Southland from the low road of man's inhumanity to man to the high road of peace and brotherhood." While King never thought he had achieved the messianic standard of love found in Jesus' cross, he did believe that his suffering and that of African Americans and their supporters would in some mysterious way redeem America from the sin of white supremacy, and thereby make this nation a just place for all. Who can doubt that those who suffered in the black freedom movement made America a better place than before? Their suffering redeemed America from the sin of legalized segregation. And those blacks among us who lived under Jim Crow know that that was no small achievement. Also, King preached that blacks should respond to violence with love instead of more violence. To love the white people who were killing them. My first thought is, I don't like this. White people were the ones who caused all these problems in the first place- we don't deserve to have the black victims "redeem" us. I agree that activists like King have inspired white people to be better, but that wasn't the main goal of their activism. Shouldn't their fight against injustice be about helping themselves and making sure other people won't suffer the same way in the future? At the same time, though, one could argue that this idea of your suffering redeeming the very people who are causing that suffering is what we see in the story of Jesus. "While we were sinners, Christ died for us," and "Father forgive them, for they know not what they do" and all that. Maybe that's what King believed. I don't know. Personally it makes me feel like maybe that theology is wrong. This chapter was about how Dr. King really did "take up the cross"- how he lived for twelve years under the threat of death because of the work he was doing for justice, and how he eventually was killed. Cone's writing about King illustrates the concept of "taking up the cross" better than anything I ever heard in church.